I was clearing the jungle at my eco-farm this morning. At one location on top of the hill, my eyes were caught by the brilliant yellow flowers of this wild ground orchid. 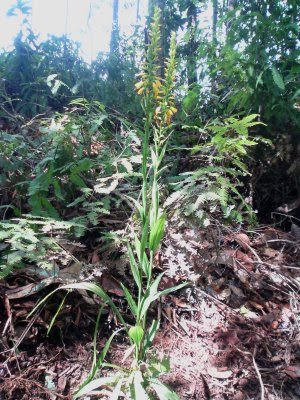 There are thousands of wild orchids in Sarawak and this particular one must be one of the thousands. I am yet to find out the name of this particular species. 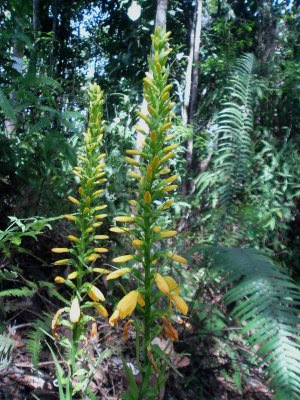 Anywhere I have dug out and moved three of them to a new location to as a starter for my collection of wild orchids of Sarawak at my eco-farm. The above is a CU view of the brilliant yellow flowers.